I love me some Dirty Rice. Especially the kind they have at Bojangle’s. If you don’t have a Bojangle’s Famous Chicken & Biscuits where you live you need to get in the car and drive South until you find one. Like, right now. I also love me some Chicken Pilau. Mama and Daddy were coming over for Sunday Dinner and I was trying to figure out how to make my one chicken stretch to feed everybody when I spied a roll of bulk sausage. Me: I wonder if I could make a Dirty-Rice-slash-Chicken-Pilau combination? Me: Prolly. But Daddy won’t like it. Me: True. He doesn’t like it when we go screwing around with his favorite foods. Me: Yeah, but I don’t want to go to the grocery store. Me: Screw it. It’ll be amazeballs. And he loves rice so he’ll live. Me: We’re having Chicken & Sausage Dirty Rice. It’s like Chicken Pilau but with bulk sausage instead of smoked sausage plus green stuff. Mama: This is good, honey. Angel Baby: I like it! Remove giblets, etc. from the chicken cavity (if included)*. Clean and rinse chicken well and place in a Dutch oven (or large pot with a tight-fitting lid). Add water, salt, black pepper and red pepper flakes. Bring to a slow simmer over medium heat. Once water begins to boil, reduce heat to medium-low, cover tightly and simmer for 1 hour. Remove chicken from broth and set aside. Strain broth and measure 4 cups liquid (not rendered fat – the fat will set on top of the broth). Set broth aside. Remove skin, bones, etc. from chicken. Cut chicken into bite sized pieces and set aside. Sauté sausage, celery, onion and bell pepper until sausage is cooked through. Add garlic and parsley then stir to combine. Combine 4 cups broth, chicken pieces, sausage mixture, Cajun seasoning and rice in your Dutch oven (or large pot with a tight-fitting lid). Bring to a boil, cover then reduce heat to medium-low. Cook for 20 minutes, stirring occasionally. Remove from heat and let sit for 15 minutes or so before serving. You must know this by now, but I just adore you. The only dirty rice around here is by Zatarins. It's good, but you know... it's a box. The only recipe's I could ever find used organ meat, so I skipped 'em. Guess what I will be making this weekened! Your version!!! And... If plans go well, I will be eating at Bojangles on April 22nd. How exciting is that???? 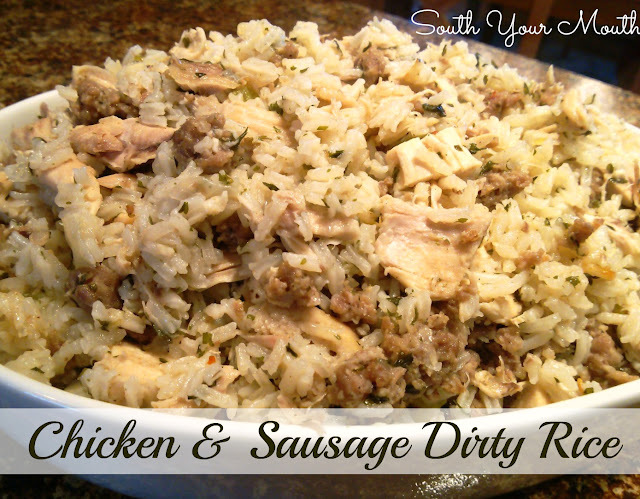 I always wondered what dirty rice is... love this recipe. pinning it. This looks delicious and I will be trying it, I enjoy your posts and recipes!!! Absolutely! Use ground beef or turkey. Just season the meat well when you brown it (I'd make sure to add red pepper, garlic, salt and pepper). This was soooo good but then I've liked everything on your site that I've tried. Thank you! This was so very flavorful! We all absolutely loved it! My boyfriend and nephews cleaned it up in one sitting - there were NO leftovers from this huge pot. And the house smelled wonderful! I had men hovering in the kitchen for an hour! A real favorite at our house! Making it again tonight! We just had this for supper and it is awesome!!! I will never buy box again! Thank you so much for this recipe! You are just awesome! Thank you the new recipe! I really like the type of rice what you advised. I cook it quite often since we bought rice cooker. The device really can cooking delicious rice many different ways. Here you can learn more hints of the rice cooker. If you like rice the device just you need in your kitchen. Hope you enjoy the review! taught the New Orleans way.